Odds are, you’re more likely to remember where your cell phone is than your car keys. Thankfully, with Ford’s incredible FordPass app, it’s (almost) all you’ll ever need! Learn more about the convenience and connectivity that FordPass, available on select Ford vehicles from Whitby’s Marigold Ford, can bring you. After using FordPass for a short time, we’re sure it’ll become your new favourite app. When paired to a FordPass Connect subscription, you’ll be able to remote start your vehicle, lock and unlock it, check on your vehicle’s fluid levels (including fuel), turn your vehicle into a Wi-Fi hotspot, and more! Check in on the health of your vehicle, or contact a dealer to book a service appointment. Find the nearest gas station, filtering by brand or grade of fuel, and even compare prices at the different gas stations. New to the area? No problem. FordPass can help find available parking for you, so you can get where you’re going quicker. And if you’re ever unsure about how anything works with FordPass, there’ll be a Ford Guide in the live chat who can walk you through your issues! Available on a number of Ford models like the F-150, Mustang, EcoSport, Escape, Explorer, and more, and compatible with Apple or Android phones, FordPass is set to make everything about owning a new Ford easier than ever. 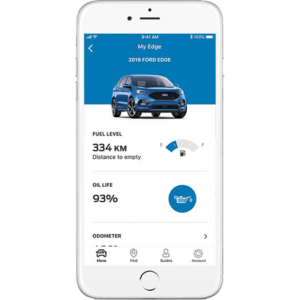 If you want to learn more about the FordPass app, then contact us today at Whitby, Ontario’s favourite Ford dealer, Marigold Ford. I agree to receive periodical offers, newsletter, safety and recall updates from Marigold Ford Sales. Consent can be withdrawn at any time.